Well, Leo, this IS news. I am lucky enough to have a happy family. Imagine my surprise to realize we are all just alike! Case in point: yesterday, Thanksgiving 2018. Joy has been abounding around here this past week, with Evan home from California following his Congressional candidate’s election victory. To add to the upbeat household mood, Julie and her boyfriend Gil would be hosting the festive holiday meal at their Brooklyn apartment. This would give us a chance to a) see their new digs and b) avoid cleaning our house: win/win! So the Seyfrieds took their act on the road yesterday morning, arriving in Crown Heights in late morning. Jules and Rose had taken on the yeoman’s share of cooking duties. We were asked to provide The Bird. Sheridan, our free-range, organic son, decided that we didn’t really like the white meat all that much, so he called Whole Foods and pre-ordered 16 turkey legs. Lined up in pans, they looked like a bizarre foodie rendering of the Rockettes. Steve contributed cranberry relish, the color of Pepto Bismol, heavy on the horseradish. Most of us chose to pace ourselves, and “reluctantly” skip Dad’s relish to make room for dessert. As for the children, Peter insisted on leaving his winter hat on all day. Aiden spent dinner, announcing (repeatedly), “I ate your uncle!” Steve is in a musical, and one of the lines in a song he’s been practicing at home is “I ain’t your uncle.” Mystery solved! 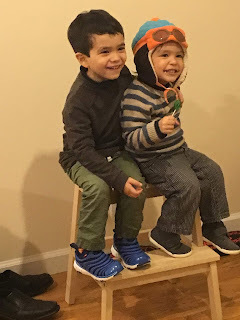 The boys were perfectly content without extra playthings, as long as they were being pushed around the apartment in Gil’s rolling desk chair, and could look out the window at the bustling Brooklyn street scene, five floors below. After dinner, we played The Game of Things: someone reads a prompt (“things you wouldn’t photograph,” for example), and then everyone writes down a response. We then had to guess who wrote which answer. Round and round we went, wrong guesses time after time. Seems we don’t know each other that well after all! Finally, we tried a variation (we’d all just write a funny response and vote on the favorite). Everything went off the rails at this point (“things grownups wish they could still do”? “Be burped.”) but the “hilarity” the game box promised did ensue. We’d been snapping candid pix all day, but of course a family photo with everyone in it was a requirement. 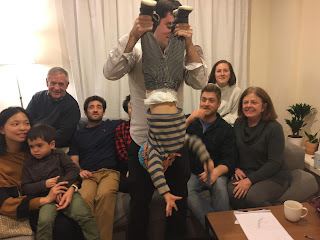 And it made perfect sense to wait until both kids melted down, for a lovely portrait featuring Aiden scowling, and Peter being held upside down to keep him from crying. Good times, captured for the ages! So that was how our happy family spent yesterday. And, if Tolstoy is correct, I assume that you too ate 16 turkey legs and a bowl of horseradish, while wearing your winter hat indoors. What are we up to for Christmas, gang? Or maybe this one instead?